The Bose SoundLink Color II offers good sound quality and tons of features in a compact, splash-proof body. However, its average battery life and form factor are compromises you’ll have to live with. If you’re looking for something from Bose to take with you on your next hike, the $130 (about £100, AU$170) SoundLink Color II is the company’s only splash-proof speaker that can stand up to the elements with an IPX4 rating. Crafting a speaker to be used outdoors always requires compromise between size, weatherproofing, battery life and form factor. 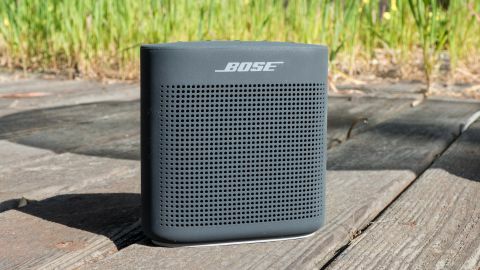 Thankfully, however, the Bose SoundLink Color II compromises very little for good sound and, while it’s not perfect, it’s still a great choice for those looking for a wireless speaker to use at the beach or on a hike. Here’s why. The Bose SoundLink Color II looks much like the first generation SoundLink Color speaker, but is coated in a soft-touch rubber instead of hard plastic. This makes the speaker feel comfortable in the hand and tough enough to survive bumps and scrapes out on the trail. Plus, like its name suggests, the portable speaker also comes in a variety of colors like blue, red, white and black, giving you plenty of options if you want your speaker to match your outdoor attire. The SoundLink Color II continues is improvements upon the original by adding IPX4 water resistance, which makes it splash proof but not waterproof. What that means is you won’t want to dunk the SoundLink Color II in the pool like you would with the JBL Charge 3 or Fugoo Go. You’ll find all of the speaker’s buttons on top, which includes playback controls, volume adjustment, power, Bluetooth pairing and Aux-In. For legacy devices, Bose has included a 3.5mm headphone jack for you to use, located next to the microUSB charging port. Also new to the SoundLink Color II is the mic, which lets you answer calls and use voice assistants like Siri or Google Assistant. Simply press and hold the multifunction button at the top to active your voice assistant to look up information or place calls. There’s also NFC built in for quick and easy pairing, which works flawlessly. Another neat feature that Bose packs in that’s quite rare for wireless speakers is multipoint Bluetooth. Multipoint technology allows two devices to pair to the SoundLink Color II simultaneously. This means you don’t have to jump through menus to switch from your phone to your tablet and it’s something we wish more wireless speakers would adopt. We’re fans of Bose’s wireless speakers like the original SoundLink Color and SoundLink Mini, and that doesn’t change with the SoundLink Color II. The SoundLink Color II offers a good dynamic range for a speaker of its size, giving us nice bass extension and impact. Mids are lush and highs are a little rolled off to prevent the speaker from being fatiguing. Also, compared to the ultra-portable JBL Clip 2, the Bose blows the JBL out of the water when it comes to sound quality. Though, maybe this shouldn’t be surprising as the Bose speaker is much larger. And while the Soundlink Color II dominates JBL’s smaller-sized speaker, step up to the JBL Charge 3 and the Bose struggles. The Charge 3 gets louder, offers more bass impact, is waterproof and offers 20 hours of battery life compared to the SoundLink Color II’s 8 hours. However, the JBL Charge 3 is much bigger and heavier than the Sound Color II, so it’s a compromise between sound quality and portability. If you want maximum bass in a waterproof speaker, get the JBL Charge 3. If you want a speaker that’s easy to carry around and sounds good enough, the Bose Soundlink Color II is a great choice. Choosing a wireless speaker is always going to be a compromise between portability, sound and water resistance. The Bose SoundLink Color II offers good sound quality and tons of features in a portable body. But, on the debit side, its 8 hours of battery life is average compared to the competition and we’d like to see Bose make the SoundLink Color III last even longer. We’d also like to see the next SoundLink Color go fully waterproof like the rest of the competition. Competitors like the $99 (about £79, AU$129) Fugoo Go offer better water resistance, a unique mounting strap and better battery life (10 hours), but lack features like an aux jack, speakerphone support and NFC. Larger speakers like the $150 (£149, about AU$200) JBL Charge 3 sound better, lasts over twice as long and can charge your phone in a pinch but at the cost of portability. The Bose SoundColor II slots between the Fugoo and JBL in terms of price, portability and performance, but beats both hands down when it comes to features. It’s not perfect but if portability, sound quality and features like NFC, multipoint bluetooth and speakerphone support are important to you, we think you’ll love the Bose SoundLink Color II too.